Weather has gone crazy again, and in the end of March it is freezing cold. Normally we would get a warm climate. I was hoping to plant some seeds, and now I have to wait until weather gets warm up. If I keep the seedling inside home, my two bundles of joys will do extensive research resulting the death of the seedling. In addition to that I get a bonus mess in my kitchen. My hubby is complaining that he is not getting any time even in weekend. Added factors are my cooking and blogging and my prince and princess curious search on everything. I don’t know how to help him. Coming to bread, this month I baked a few breads and now I am using tangzhong method/water roux method more frequently why? First I selected theme of tangzhong methodfor Baking Partners challenge, then came Aparna’sWe Knead to Bake challenge. She also challenged with Hokkaido milk bread using Tangzhong method. She used this recipewhich in turn was an adaptation from 65 Degrees Tangzhong “65C Bread Doctor” by Yvonne Chen. One good thing about this method is that it is forgiving, even if you make some mistakes you will end up with soft bread, and it is really difficult to spoil the bread. If you are wondering what is Tangzhong method, it is method of making water roux at 60 °C and then using that roux to make the dough, and to bake the bread, I have explained here in the post. Please take a look at here. Hokkaido is the second largest island in Japan, it is known for its pristine nature. I did not get a chance to visit Hokkaido during my stay in Japan. I wish I could have. 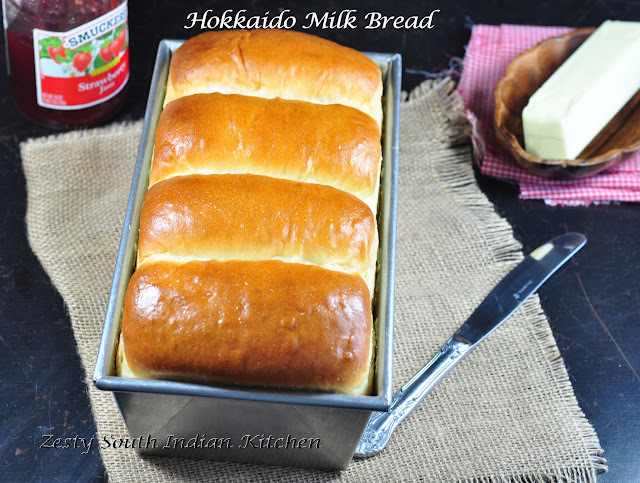 Hokkaido milk bread is soft and white and made with all derivatives of milk, such as fresh milk, cream, milk powder. The result is soft white, melt in mouth bread. You will fell in love with it. It is really hard to stop eating them. I think milk and its derivatives made the yeast very happy and it happily worked overtime to make tall loaf. I didn’t make any shaped bread with this dough as dough is really soft and sticky and it was really hard to carve the shape for me. So decide to make in a single loaf pan. My hubby made his famous pav bhaji and we enjoyed this bread for our dinner and next day breakfast. I think if you are new into bread making, you would become a fan of soft bread. You can try to start bread baking adventure with this bread, which is easy to put together and the end result will be amazing. I made dough with my trusted Kitchen Aid mixer; it did all the work for me, except few kneading parts which were done by me. I wanted to feel the dough while baking and that gives me intense satisfaction. I don’t want to miss it. I used active dry yeast, and if you want you can use instant yeast. If you are using instant yeast you need to reduce 25 % of yeast, and proofed for 90 minutes and then the second rise for about 49 minutes and after baking at 350°F for 1 hour; I got this beautiful golden color bread, which is cottony white and soft in the interior. Even though suggested recipe was without egg, I like to do egg wash on my recipe. Nothing beat the color which egg wash gives and I am a huge fan of it. Try for yourself, it won’t disappoint you. I think this will make beautiful hot dog buns. I am not sure about hamburger buns as it is really soft. Here comes the recipe. 1 egg + l teaspoon of water for egg wash. In a medium saucepan whisk together lightly the flour, water and milk in a saucepan until smooth and there are no lumps. Place the saucepan on the stove, and over medium heat, let the roux cook till it starts thickening. Keep stirring/ whisking constantly so no lumps form and the roux is smooth. If you have a thermometer, cook the roux/ tangzhong till it reaches 65C (150F) and take it off the heat. If you don’t have a thermometer, then watch the roux/ tangzhong until you start seeing “lines” forming in the roux/ tangzhong as you whisk/ stir it. Take the pan off the heat at this point. Let the roux/ tangzhong cool completely and rest for about 2 to 3 hours at least. If not using immediately, transfer the roux to a bowl and cover using plastic wrap. It can be stored in the refrigerator until the color changes. Discard the tangzhong after that. In a bowl of kitchen aid stand mixer add bread flour, salt, sugar and milk powder and set aside. In microwave safe bowl heat milk, whipping cream and butter for about 30 minutes and set aside. In a small bowl add 3 tablespoon of lukewarm water and add active dry yeast and set aside for 5 minutes. Kitchen aid stand mixer fitted with paddle attachment mix in, tangzhong mixture, and milk-cream-butter and yeast mixture into flour mixture. Remove the paddle attachment and attach dough hook and knead until it become soft and sticky for about 15 minutes on medium speed. Once the dough starts leaves the side and knead with hand for about 3 more minutes or until when you pull the dough it will spread without tearing, means it passes window pan test. Remove the dough and place it into well oil pan bowl for doubling. Cover with plastic wrap and a towel, and let the dough rise for about 90 minutes or till almost double in volume. Place the dough on your working surface. About 862g dough divides into 4 equal pieces of 215g. You don’t need flour to work or shape this dough. 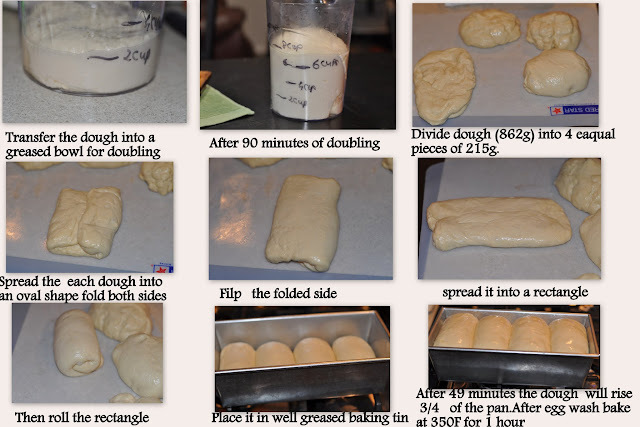 Roll this folded dough with the rolling pin so the unfolded edges are stretched out to form a rectangle. Roll the rectangle from one short edge to the other, pinching the edges to seal well. Do this with each of the four larger pieces and place them, sealed edges down, in a well-oiled loaf tin. Cover with a towel and leave the dough to rise for about 49 minutes. Carefully brush the tops of the dough with egg wash and bake at 350F for about 1 hours or it register internal temperature of 190-200 F. If the top starts browning earlier, tent the loaf tin with foil to prevent extra burning. Let them cool in the tins for about 5 minutes and then unmold and transfer to a rack till slightly warm or cool. I have been waiting to start a kitchen garden too. Its hot one day and the next day its freezing. Its Ca hello, but who can fight with nature. Coming to the bread, I love the texture in the bread. Will try both the bread types you guys have all baked. I see it in so many blogs and very impressed. Nice Job. I do not know how you manage doing all this with 2 kids. You must be super efficient. This bread looks so yummy and wonderful!! 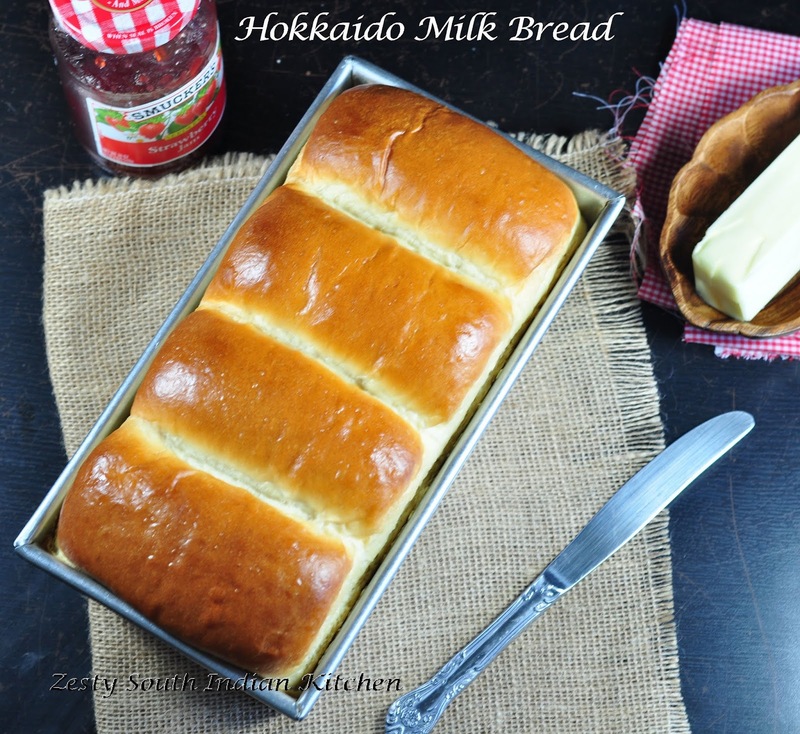 Never heard of milk bread before, but it sounds delicious! Yes I would love to visit Hokkaido, just for this bread and ice cream. Beautifully baked bread! Loved the last but one picture a lot. 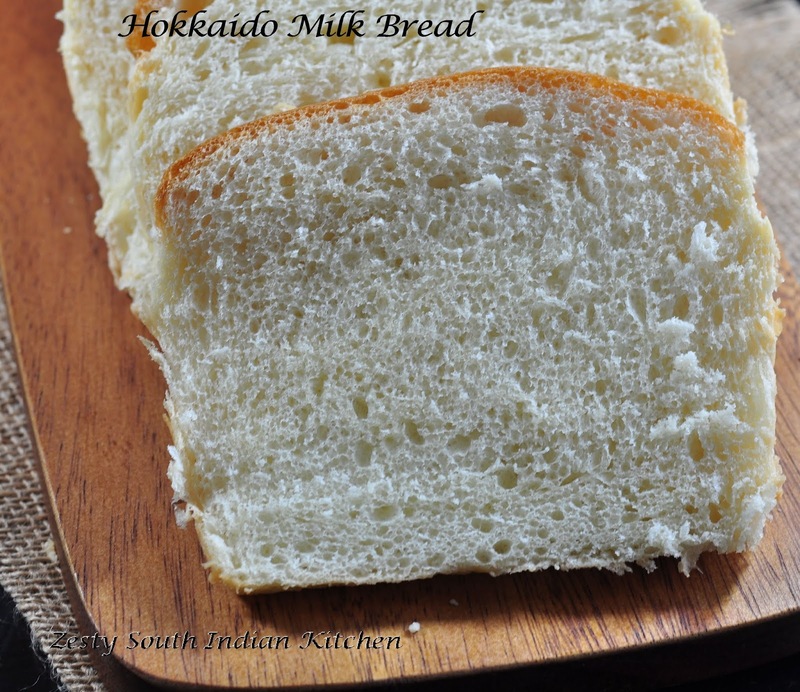 I am so impressive and excited to see this hokkaido bread which I buy from the bakery. What a smashing outcome, soft and I can feel the moments of melting in my mouth. Wow you have done it so beautifully!!! i missed all my breads this month.. Hope to do this soon!! Beautiful bread,looks super spongy,light and airy. Swati, you are one super baker, wish I could bake like you, the bread looks simply too good.. Bread looks very soft and delicious..i am very nervous when it comes to baking a bread..i think will try this method.. The last pic pulls me a lot.bookmarking it. Ohhh Swathi, that bread looks so soft! Perfect for this cup of tea that I am sipping right now! Wow amazing texture Swathi,looks so good,home made is the best. super soft and fluffy..I am going crazy for these breads now a days. Amazing .. Bread looks super soft and fluffy.. Well explained with step by step pictures.. It will be easy for even beginners to understand.. Beautiful!! Love the colour on the top! very soft n perfect bread. That looks so soft and spongy – delicious! Yummy and perfectly made bread. Your last picture is stunning Swathi. Beautiful. 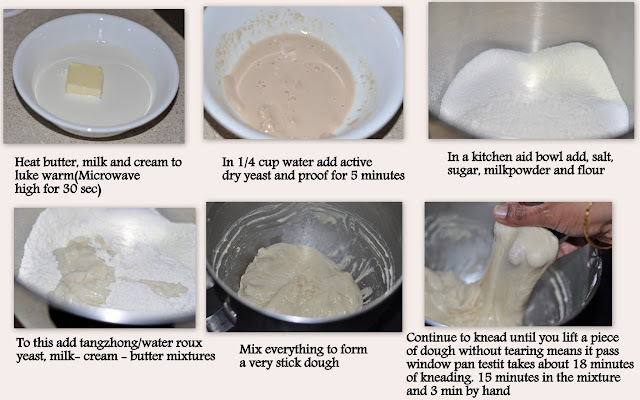 I’m really interested in the roux method – what an interesting technique. Your breads are so beautiful, Swathi, and this one looks wonderful! 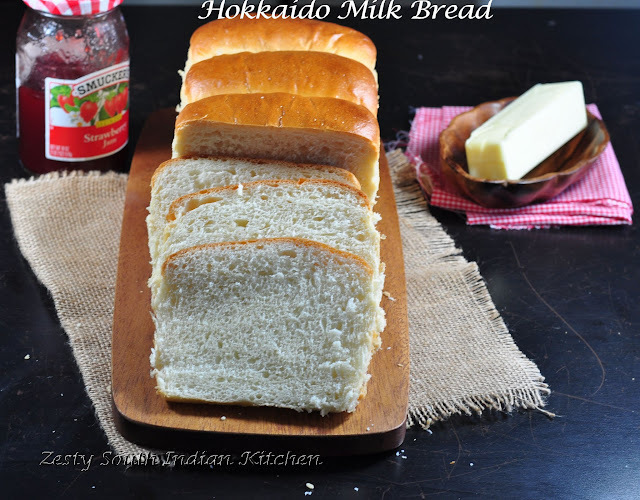 I like milk breads – I think milk gives the bread a lovely flavour and texture. You are a bread baking goddess Swathi! Love this beautiful, soft bread. You are right – hard to stop eating.